Spread nuts in pie pan or on baking sheet. Roast for 5 minutes. Stir, and bake 3 minutes longer. Immediately transfer nuts to a plate to cool, and set aside. To remove hard stem from leafy part of the kale, hold leaf in one hand, upside down and closed like a book. Pull center stalk away from the leaf and down. Tear stemmed kale leaves into 2- to 3-inch pieces; there should be about 12 to 14 lightly packed cups. Add kale to pot of water, pushing it down with a wooden spoon. Cook until kale is bright green and crisp-tender, 3 to 4 minutes. Do not overcook. With a slotted spoon, transfer kale to a colander and set under cold running water to cool. Save as much cooking water as desired to drink and use in soups. It will keep 3 days in the refrigerator, 2 months frozen. A handful at a time, squeeze most of moisture from kale. To chop kale, place clumps on a cutting board and cut crosswise into thin slices. Heat oil in a heavy, medium skillet over medium-high heat. Add shallots, and cook until limp and translucent, 3 to 4 minutes. Add kale, pulling it apart into shreds. Add apple juice, cayenne pepper, salt and black pepper to taste. Stir occasionally for 5 to 6 minutes or until kale is cooked to your taste and most liquid has evaporated. Spoon kale into a shallow, wide serving bowl. 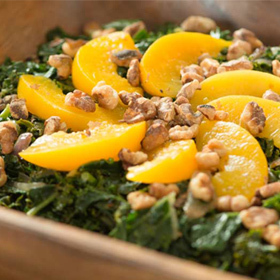 Sprinkle on nuts and arrange peach slices over kale. Serve hot or lukewarm. Serving size: 1/4 of recipe. Amount per serving: 220 calories, 10g total fat (1g saturated fat), 31g carbohydrates, 8g protein, 5g dietary fiber, 90mg sodium.